But the Tiglianidis brothers felt that they could differentiate themselves from the crowd by focusing on Greek dishes. So when the space next door opened, they decided to move and transform the family business. My taste buds are sure happy they did because the Feisty Greek is home to one of my all-time favorite sandwiches: the pork gyro ($7.50). Crispy, yet juicy shreds of spit-roasted pork mingle with tomatoes, onion, French fries (yes, in the sandwich! ), and cold, garlic-kissed tzatziki, all wrapped in fluffy pita bread. “There are traditionalists in Greece who call it blasphemy to put [French fries] in, but if you order gyro in Greece, regular way, it’s going to be the tzatziki, tomatoes, onions and French fries inside,” says George. I wave aside any debate over whether French fries should or shouldn’t be in a sandwich the same way that I wave aside the debate over whether I should or shouldn’t have two desserts with my meal. If you aren’t already googling directions to the Feisty Greek, then maybe you’ve never had a gyro like this gyro, or maybe—gasp!—you’ve never even had gyro at all! What a travesty. Let’s right this wrong, shall we? Gyro, pronounced yee-ro with a rolled “r,” is a Greek method of cooking meat using a vertical rotisserie. It is quite possibly my favorite way of indulging in deep umami flavor. Top-notch gyro is better than bacon, and I daresay even better than pork belly. (Those are fighting words, I know, but bear with me here.) When combined with the creamy tzatziki and crisp French fries, sandwiches don’t get better than this. A word about tzatziki and its cousin, tirokafteri (both $5 per half-pint). I hold both in a certain reverence. They are similarly magical, but subtley different; let me explain. 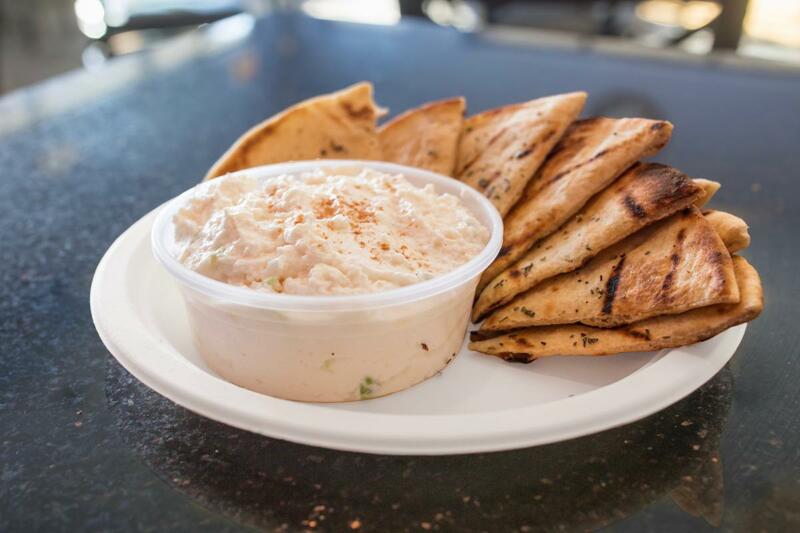 Tirokafteri, listed as the “feisty feta” spread at the Feisty Greek, is a mixture of feta cheese, ricotta, olive oil and pepper. (The Tiglianidis brothers were unable to find a particular variety of Greek pepper they wanted in the United States, but found that habanero works as a solid substitute.) Tzatziki is a sauce made from Greek yogurt, cucumber, dill and garlic. Tzatziki and tirokafteri are staples of Greek cuisines, typically served as appetizers with warm pita bread. Both are cold, creamy and spicy. Nevertheless, they are distinct. The tzatziki has a cooling sourness with an after-bite from the garlic. The tirokafteri brings heat from the habanero. The magic of both is that they go with anything and everything savory: starches, chicken, vegetables, pork and gyro, of course. Soldiering on, despite a gyro-induced fullness, it’s time for spanakopita ($6.25). 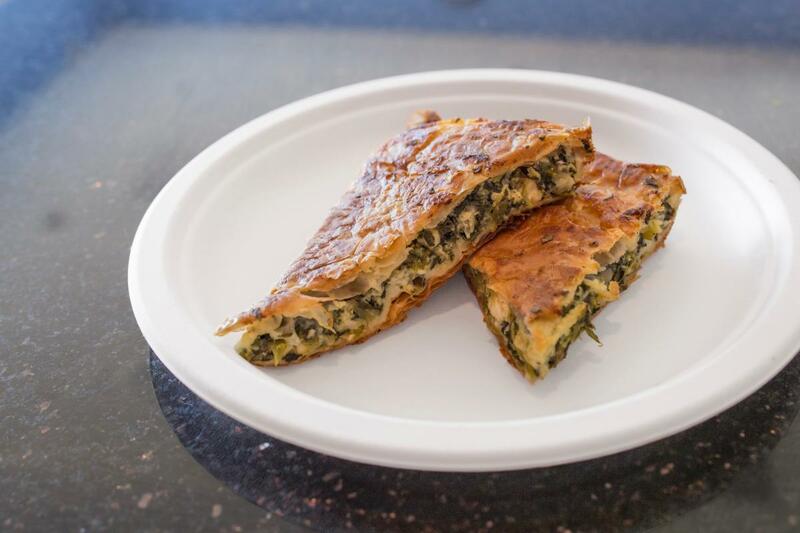 Often referred to as “spinach pie,” the savory pastry features dozens of layers of paper-thin filo dough, sandwiching a warm filling of spinach and feta cheese. 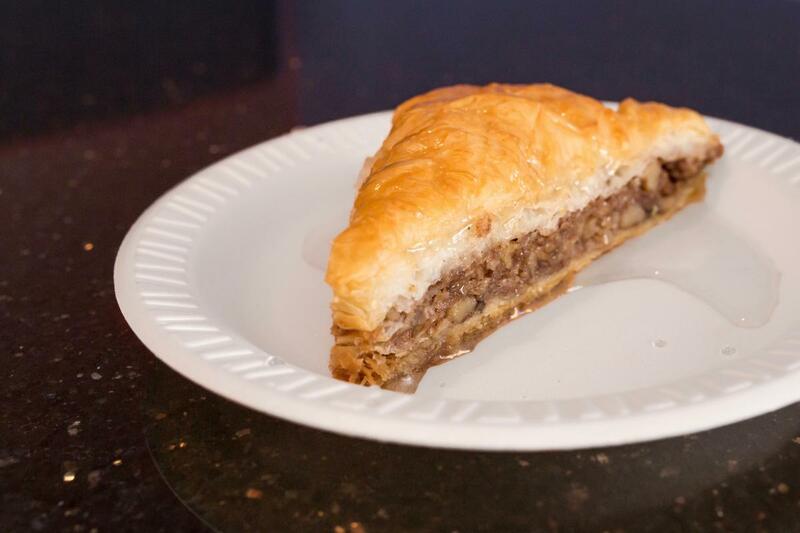 For the heavenly filo dough in dessert form, you want the baklava ($3), made by George’s wife, Tina. The buttery pastry holds a cinnamon sugar walnut mixture so unapologetically sweet that I wonder how I will ever finish the serving, which is larger than my palm; somehow, I always do. I love seeing how different cuisines do the donut: Italian zeppole, Spanish churros, French beignets, and at the Feisty Greek, loukoumades ($5 for six). 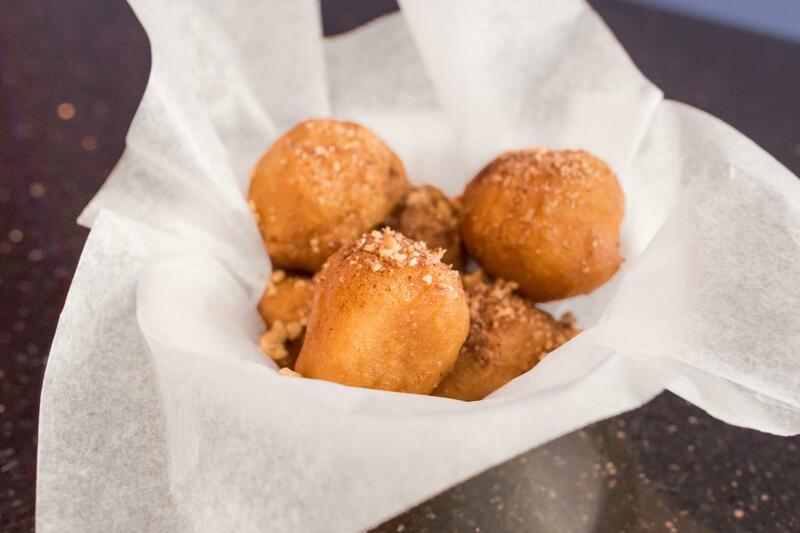 These hot, fluffy fried dough balls are slightly bigger than your average doughnut hole—two smaller bites, rather than one big one—and sprinkled with a cinnamon-walnut crumble. What a way to wrap up a meal. The restaurant is always bustling, but there are enough tables that I’ve never had trouble finding a seat. And the restaurant staff—most of whom are members of the Tiglianidis family—seem as happy as the customers. That crazy chemistry might be their secret. With a pork gyro sandwich like this, I’ll keep showing up as long as they do. And you should too.